Tue, Aug 14, 2018, 12:29 pm SL Time, ColomboPage News Desk, Sri Lanka. 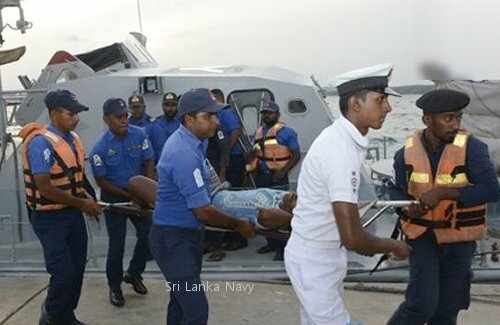 Aug 14, Colombo: Sri Lanka Navy personnel had come to the aid of a seriously ill fisherman aboard a multi-day fishing trawler in deep sea yesterday and brought him ashore for immediate treatment. On receipt of information from the Trincomalee Fisheries Inspector, the Navy dispatched the Fast Attack Craft P 439 attached to the Eastern Naval Command to retrieve the patient who was vomiting blood. The fisherman had left for fishing from the Cod-bay fisheries harbor on 04th July aboard the multi day fishing trawler. The patient was carefully transferred to the Fast Attack Craft about 90 nautical miles off the Foul Point, Trincomalee. After taking the fisherman to the Naval Dockyard, he was rushed to the General Hospital of Trincomalee for further treatment.